Read and listen to the original radio and web story at KQED's website here. 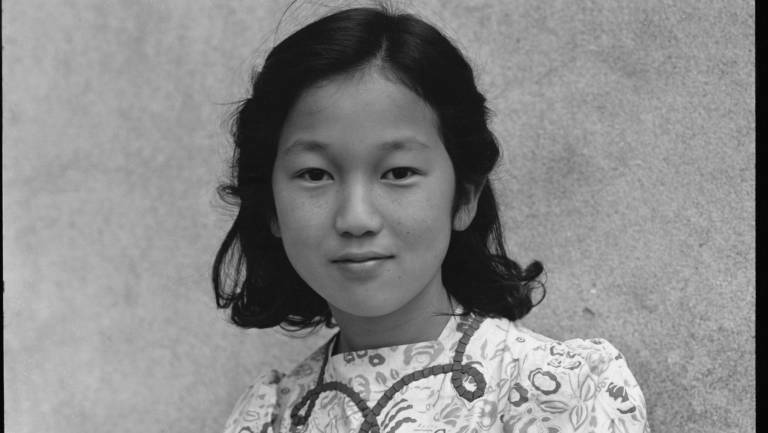 Lange’s portrait of Rachel Kuruma is startling in its simplicity: The 11-year-old San Francisco schoolkid looks into the camera, smiling quietly, in a cute, floral-print dress. The shock comes at the fact that only days after Lange shot this photo at Raphael Weill Elementary School on April 20, 1942, Kuruma and her family were bundled off to prison camp. Fast forward 75 years, and Kuruma is back at her former school for the very first time since Lange took her picture in 1942. Cahan and Kuruma have become friends since he tracked her down for his book project last year, and we're there to see if the surroundings might help jog childhood memories for Kuruma. But the school, which is now called Rosa Parks Elementary, has changed almost beyond recognition since she was a student. And the spry, 85-year-old has absolutely no recollection of posing for Lange. 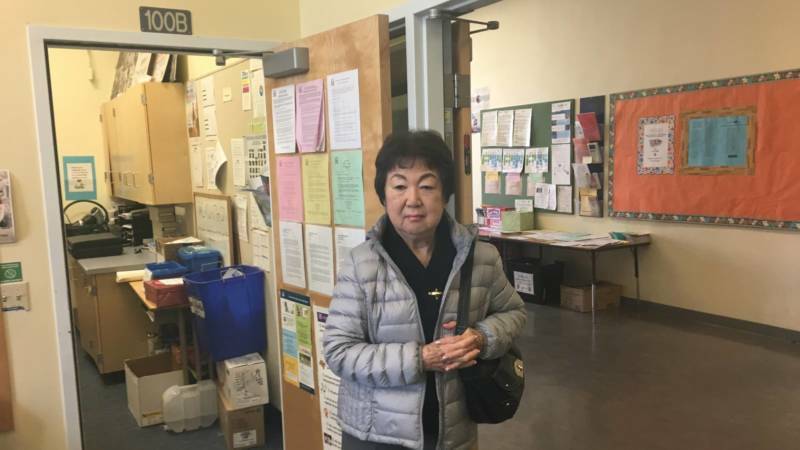 Rachel Kuruma returns to Raphael Weill Elementary School, now called Rosa Parks Elementary, on Jan. 24, 2017. 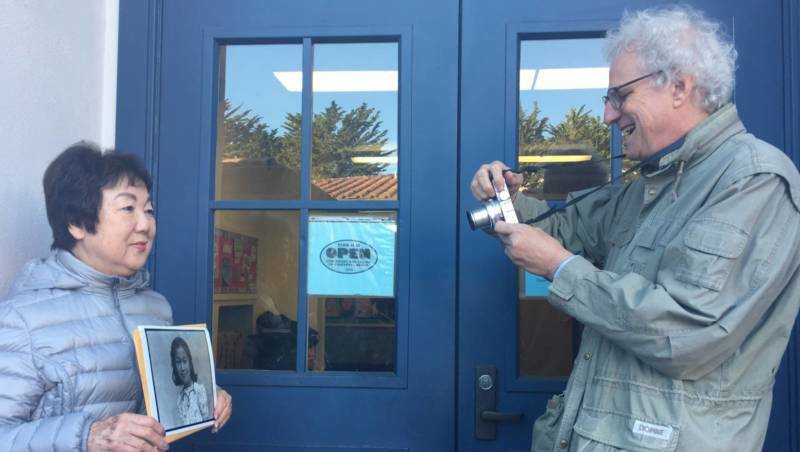 It was her first time back since Dorothea Lange took her picture there in 1942. On Feb. 19, 1942, in response to the Japanese attack on Pearl Harbor, President Franklin D. Roosevelt signed Executive Order 9066. This led to the incarceration of 120,000 Japanese Americans during World War II at prison camps across the western United States. Roosevelt’s government hired photographers like Lange to show off the camps in their best light. But she and some of the other hired guns ended up exposing what life in the dusty, hastily-built enclaves was really like. As a result, Cahan says, some of her images were locked away during the war. “They were impounded primarily because they gave away ‘military secrets’ -- that guards were using machine guns and that there was barbed wire around the camp,” Cahan says. After the war, the photos ended up in the National Archives in Washington, D.C, where the collection can still be found today. (It’s also available online.) Many more photos from the approx. 7,500-image collection have appeared in publications since the war years. But Cahan and his co-author decided they wanted to go deeper, to truly get people to understand what innocent Japanese Americans went through during the war. So they set about capturing the personal stories of as many of the people in the pictures as they could. Rachel Kuruma poses for Richard Cahan in roughly the same spot where Dorothea Lange took Kurumas picture on Apr. 20, 1942. Cahan says tracking down survivors wasn’t easy. In Kuruma’s case, her name was misspelled in the records -- as “Rachael Kurumi” instead of “Rachel Kuruma." “I had the list of all of the survivors of the camps,” Cahan says. “There was no ‘Rachael’ spelled that way, and there was no ‘Kurumi’ spelled that way." Rachel Kuruma hung up the phone when Richard Cahan first called her. Now the prison camp survivor and photojournalist are friends. Some of the people the authors approached weren’t so taken by surprise when Cahan got in touch. 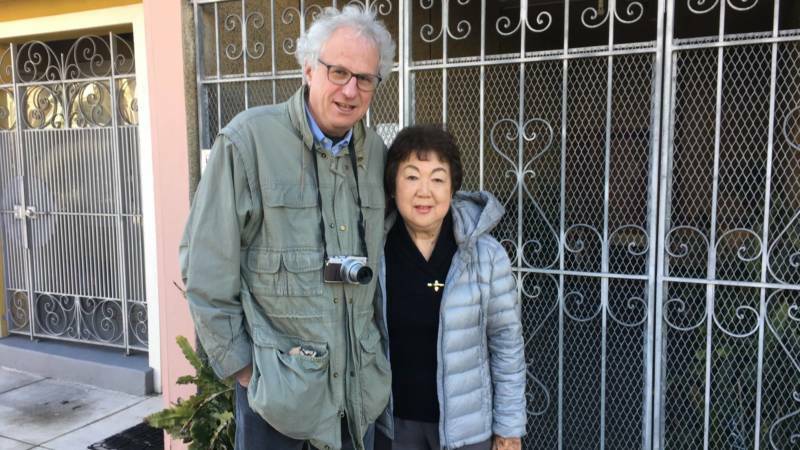 Berkeley psychotherapist, filmmaker and activist Satsuki Ina was born in a maximum security prison camp in Tule Lake, California in 1944, after her parents were labeled as dissidents for refusing to swear unqualified allegiance to the United States. She’s studied the National Archives photo collection. The arresting image in Cahan and Williams’ book of a young woman standing in line in San Francisco, waiting to hear news of her fate, is one Ina knows very well. 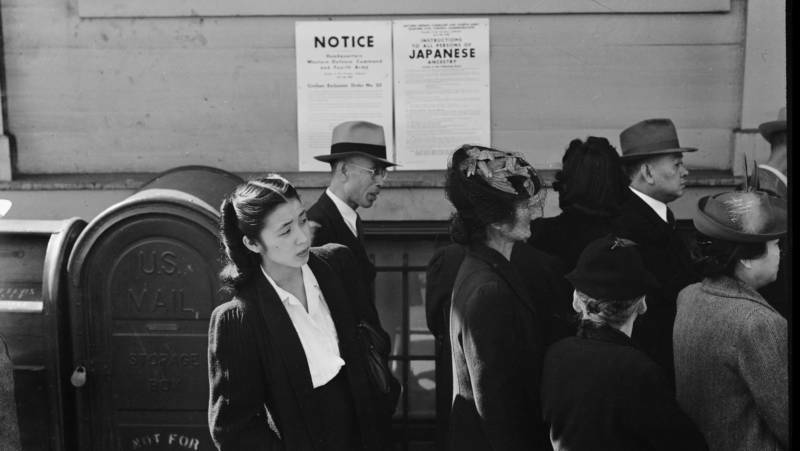 Shizuko Ina waits in line in San Francisco to hear news of her fate in the wake of President Franklin D. Roosevelt signing Executive Order 9066. Ina has made a study of her parents’ diaries and letters from the camp. She shows me her mother’s original journals, segments of which she gave Cahan and Williams permission to use in their book. Ina locates the entry dated Friday, Apr. 24, 1942, from right before Lange took that photo of her mother. 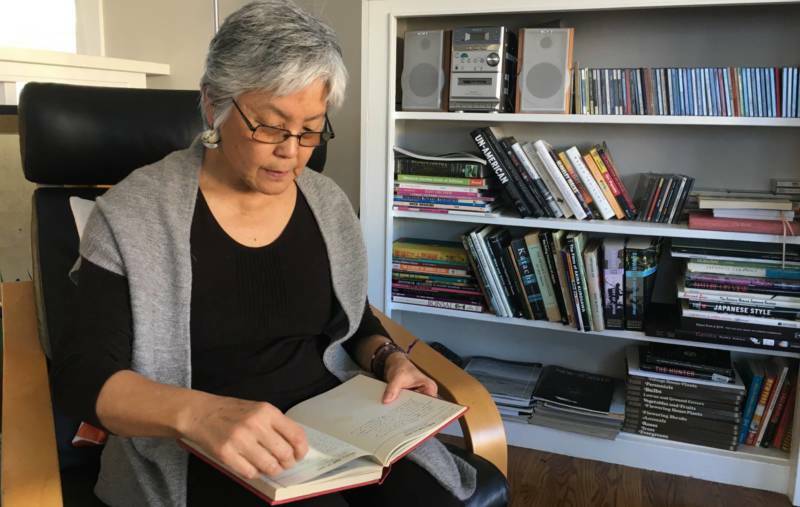 Satsuki Ina reads her mother's journal at home in Berkeley. Like Cahan, Ina says she wants to do everything she can to teach people about this irredeemable chapter of American history -- to prevent the same horrors from happening again. Editor's note: Although the phrase "internment camps" is most commonly used in this country to describe the sites where 120,000 people of Japanese ancestry were incarcerated during the WWII, many members of the Japanese community believe that "internment" is not an accurate descriptor for the camps. Members of the Japanese community believe they were wrongfully imprisoned, and many use the terms "incarceration camps" or "prison camps" to describe the sites where they were detained against their will. We opted to use these terms in lieu of the more common term out of respect for the community.